This species has undergone a massive drop since our First Atlas. Redpolls used to breed almost everywhere across the northern half of the county, but now are restricted mainly to the two areas of Forestry Commission coniferous plantations, Delamere and Macclesfield Forests, and the Inner Mersey valley, with scattered records elsewhere in the county. The fall in Cheshire and Wirral mimics that nationally: the BTO population index peaked in the mid-1970s and has been in free-fall since then, to a level where the present national index is about 98% below that at the peak thirty years ago. Despite this precipitous decline, Lesser Redpoll has conservatively been included only on the amber list of species of conservation concern because the data might not be representative, and only in 2007 has it been added to the UK BAP. Their rapid decrease appears to be driven by drops in productivity and survival rates, possibly linked to smaller areas of suitable young forest growth (Fuller et al 2005). However, the reasons for the decline are not well established and research into its ecology is urgently needed. Redpolls are birds of pioneer woodland, nesting mainly in birch scrub, alder, sallow and hawthorn, as well as young conifer plantations (Newton 1972). Out of the 75 habitat records submitted during this Atlas, 36 were woodland, 17 scrub and 15 suburban or rural human sites. As with all the ‘woodland finches’, this is a difficult species in which to prove breeding, and just three observers were fortunate enough to get a two-letter code, one each of NE, ON and RF. Redpolls are not territorial and several birds may join in display flight, dancing over the tree-tops: such observations accounted for most of the probable breeding records. Typically, groups of up to six pairs nest close together in loose colonies. They breed from late April to July, with their brief incubation and fledging periods allowing time for up to three broods. 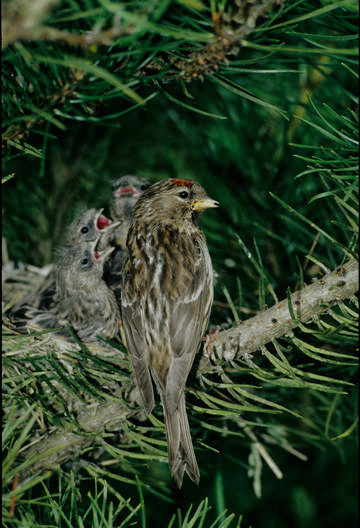 In Scandinavia, Common Redpolls may have one brood in one area then move long distances north, perhaps hundreds of kilometres, for a further attempt later in the same season. Early in the breeding season, Redpolls feed themselves and any early broods mainly on the flowers and seeds of willow and associated bud-dwelling insects; birds then move on to seeds of grasses and other weeds, but switch to birch seeds as soon as they become available, usually in July. Although study of the species’ habitat needs and life cycle has been lacking, there has been more research on its taxonomy, resulting in the decision in 2000 by the BOU that Lesser Redpoll Carduelis cabaret should be treated as a separate species from Common Redpoll Carduelis flammea. Lesser Redpolls have an unusual distribution, being restricted largely to the British Isles and nearby continental Europe, and the Alps.